medGadget: “Scientists from the Scripps Research Institute have successfully reengineered vancomycin. They have reported their findings in the Journal of the American Chemical Society. This research could be a solution in the treatment of patients infected with highly resistant bacteria. Vancomycin is often considered the antiobiotic of last resort, if other antibiotics have failed to do the job. But the emergence of vancomycin-resistant bacteria is becoming a major health problem. 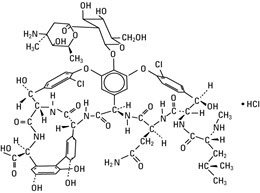 Vancomycin works by binding the D-alanyl-D-alanine terminal dipeptide of peptidoglycan precursors, used by bacteria for constructing their cell walls. By binding it, the bacteria can not use the peptidoglycan anymore and they die. But certain bacteria have altered their peptidoglycan by replacing an amide with an ester, resulting in vacomycin resistance. Vancomycin is an oldie, but a goodie. It continues to be useful despite its age. Several drugs have been developed over the years to replace it, but for one reason or another the newer agents tend to fall out of favor. With that said, vancomycin won’t last forever as bacteria are slowing finding ways to combat its mechanism of action. So instead of finding a new drug, someone decided to alter the old one. Go figure.